By Tom Ward, Senior Vice President, Digital Operations, Walmart U.S.
For a Walmart customer who has just started using grocery pickup, it might seem like shopping can’t get much easier – just order online, pull up to a parking space, and wait for an associate to load the items. Easy. Retail is changing at a rapid pace, and what’s “easy” in 2018 might feel old-fashioned in 2028. In fact, Walmart is already offering grocery delivery in nearly 100 metro areas and is continuing to innovate to find new ways to serve customers – better, faster, and easier. That’s why we are partnering with Ford to explore delivery with autonomous vehicle technology. We’re still learning – it’s a pilot – but, we want to make sure we stay on the cutting edge of grocery delivery by exploring what’s new and next. For example, we recently explored a small pilot project with Waymo, to start exploring how customers will want to use self-driving cars when it comes to their grocery shopping. The pilot program with Ford is taking place in Miami-Dade County. Through it, we aim to learn more about how we can take advantage of self-driving vehicles to deliver fresh groceries – hand-picked by our personal shoppers – to customers. In Miami, Postmates serves as our delivery partner and is already connected to Ford’s digital platform. 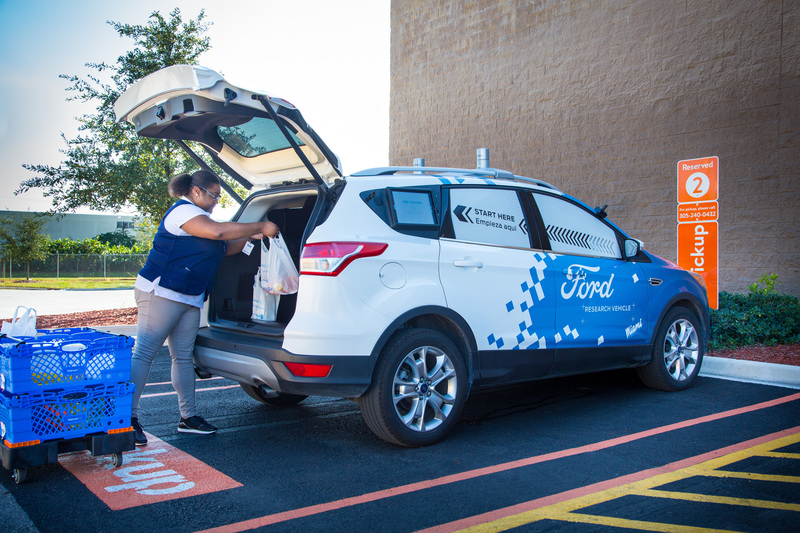 Walmart and Ford agree autonomous vehicles have an important role to play as we consider the future of delivery. Before self-driving cars can go mainstream, we must get a better sense of how people want to interact with them. Together, we will gather crucial data to learn the best way to bring items to customers. There’s no telling what innovation the future will bring, but Walmart is committed to staying on the forefront of change to make getting groceries simple, quick and easy.